Viewing topic "creating an arpeggio"
But I have absolutely no idea where to start? Any help would be appreciated. I have a S90ES. 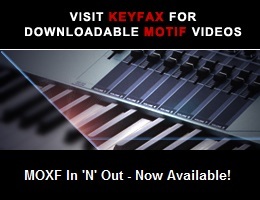 In order to create ARPEGGIOS, you need to get either a Motif-series keyboard or the MOX-series keyboard. They have built-in recording sequencers - which is necessary to create your own data. The S-series does not have a built-in recording sequencer, so you cannot create arpeggios, sorry. So if I have my lead synth sound and I would want to use a factory setting arpeggio, can I add this to that track in performance mode or master mode? And then how can you do that? I’m just getting the hang of programming with the S90ES. Also I am trying to figure out how to VIEW individual performance tracks in master mode so I can mute them. When I change my master in live gigging I’d like to see the tracks so I can mute some for parts.